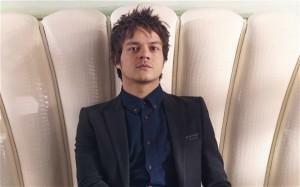 When putting together his new album, Momentum, Jamie Cullum was faced with a dilemma. He had recorded a version of Pure Imagination, from Willy Wonka & the Chocolate Factory, the 1971 musical adapted from the 1964 book Charlie and the Chocolate Factory, by Roald Dahl – or, as Cullum would be entitled to view the late author, his grandfather-in-law. In January 2010 the jazz pianist and songwriter married Sophie Dahl, daughter of Roald’s daughter Tessa. At one point he had 15 songs jostling for space on an album whose tracklisting he wanted to keep at a round and snappy dozen. Whether or not to include Pure Imagination was a tough decision. Cullum is all too aware of the irony of his covering the song, not least in light of his previous reluctance to discuss his relationship with the woman with the famous last-name he met in 2007. “But I’ve been playing that song for years,” he avers. In any case, it’s not about paying homage to the wife’s family – he was more moved by his love for the work of actor/songwriter Anthony Newley, who composed the soundtrack number (sung in the film by Gene Wilder). “I did a version because it’s one of the songs that I’ve always loved.” Cullum’s need for a pre-emptive strike against snarky comment, plus his desire for privacy, are making him hesitant, jamming a spoke in the wheels of the smooth, confident rolling speech that makes him a natural radio presenter. He began his weekly Radio 2 jazz show in spring 2010, and is nominated for Music Radio Broadcaster of the Year at this month’s Sony Radio Academy Awards. “But, you know, I’m sure there’s a nod to it,” he continues, meaning his wife’s family heritage, “deep down in my brain. But I think had it not come out so successfully, it wouldn’t be on there. “I mean, I haven’t even got the lyrics right!” the 33 year-old exclaims, as if to vouchsafe the spirit of genuine fannish improv that informed the recording. It’s the same, he adds, with the album’s reworked tilt at Love for Sale – a song he originally covered on his 1999 debut, Heard it all Before. Continue reading this interview in full at Telegraph.co.uk.